This character counts poster is a visual reminder for your students. The 6 pillars of character counts are: Trustworthiness, Respect, Responsibility, Fairness, Caring, and Citizenship. This listing is for the pillar of CARING. 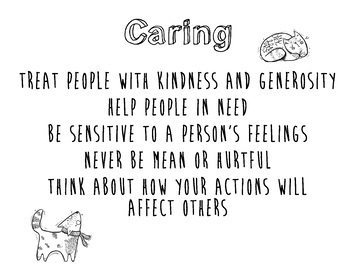 The digital download is for 1 10x8 caring sign that is monochromatic and includes what caring is.